Note about confessions: Confession is an integral part of preparation for Nativity and is required in order to receive communion at the feast. There are opportunities for confession Dec 26 and Jan 2 before Vespers. You are strongly encouraged to contact Fr Vladimir to schedule a time on one of these dates as soon as possible. If you require other arrangements, you can discuss this with Fr. Vladimir. When contacting Fr Vladimir, keep in mind that he travels to Halifax on Sat. Any emails sent after 7:30 Friday or voice mail left at 902-543-1760 after 1:00 pm Sat will not be seen or heard before he leaves for Halifax. Note as well that his cell phone 902-483-7492 is only operational while he is in Halifax. 2016 Parish calendars: The calendars are available for sale. There are English and bilingual English-Russian versions. The price is $10. Saturday afternoon, there is a neighbourhood event in support of keeping the current bus route of the number 15, which services our parish. As many are aware, the city is proposing to have the route end at Williams Lake Road, thus eliminating bus access to our church. Our choir will be participating. We pray that Fr Vladimir recovers quickly. Nativity Fast — Saturday marks the start of the Nativity Fast to prepare ourselves for the feast of the Nativity of our Lord. Confession is an important part of this preparation. Please contact Fr Vladimir to schedule a time for confession. Note that confessions are normally heard Saturdays before Vespers, but alternate arrangements can sometimes be made for those from outside Halifax. If you have questions about establishing a fasting discipline for this period, please talk to Fr Vladimir. Some thoughts on the purpose of fasting can be found here. Fri Nov 13: The Antiochian parish of St.Antonios will be moving to its new location, 2480 Windsor Street (the church of St. Matthias on the corner of Windsor and Chebucto). Everyone is invited to a Night vigil at 5:00pm-11:00pm to be presided by His Grace Metropolitan Ephrem of Tripoli, Lebanon, which will be followed by Cocktail reception in the church hall. Sat Nov 14: Baptism of Eleni Giannoulis at St. George’s Greek Orthodox Church 12:00 pm, followed by lunch at Ela Greek Taverna in Bayers Lake. All are welcome! May God grant Eleni, her parents and sponsors many years! Sun Nov 15: Prayer service followed by parish business meeting 10:30 am. Please make every effort to attend as we discuss the business and future of our parish. You must be a member to vote. Please send completed membership forms to Fr Dn Alexander or bring to church. Please bring a blow dryer if you have one to help finish the windows. After Liturgy, there will be a work bee to prepare the building for winter. Please help if you can. Don’t forget to turn your clocks back one hour tonight, otherwise you’ll be waiting a long time at church for the start of services. Reminder: The parish business meeting has been rescheduled to Nov 15.
Business Meeting: due to a large number of absences this weekend, we do not expect to be able to meet quorum for the meeting, therefore it has been postponed to Nov 15. On Saturday, at 4:30, Donald Michaluk will be christmated and received into the Holy Orthodox Church. Please pray for him as he prepares for this. Next weekend, we will celebrate the feast of the Exaltation of the Holy and Precious Cross. Please note that this weekend we will have readers services. Note that we will celebrate the feast of Transfiguration the weekend of Aug 22-23. Confession: Along with fasting, we prepare ourselves for the feast of the Dormition of the Mother of God through the sacrament of confession. Father Vladimir will be available Sat Aug 22 4:00-5:30 pm by appointment for confessions. Please contact Father to schedule a time. In the present practice of the Russian Church, the Lesser Sanctification of Water on August 1 is done either before or after Liturgy. Because of the Blessing of Water, this first Feast of the Savior in August is sometimes called “Savior of the Water.” There may also be a Blessing of New Honey today, which is why the Feast is also called “Savior of the Honey.” From this day the newly gathered honey is blessed and tasted. 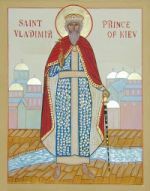 Sun July 19: Celebration of the feast of St. Vladimir of Kiev, our patron saint. Hours, Liturgy and potluck picnic, 10:30am at Fr. Vladimir’s house chapel in Pinehurst, just outside of New Germany. Address: 3448 Highway 10. Take Hwy 103 towards Yarmouth, exit 12 (Bridgewater), turn right onto Highway 10 to New Germany. Fr Vladimir’s house is exactly 15 kms from the exit. You will pass a sign for Pinehurst, the speed limit will drop to 70, just past that point you’ll see a cemetery and a white house. The entrance to the driveway is before the cemetery and there is a small church directly across the street. If you require a ride, please contact Reuben (dot) penner (at) gmail (dot) com and he’ll try to find you a lift. Anything rotten, moldy or unusable should be bagged (in clear bags!) and taken outside nex to the front steps. We will ask parish members to pick up a few bags for the curb collection. There is a box of clear bags on a shelf in the closet. The stuff next to the closet door (cleaning tools and a shelf with supplies) can remain untouched, everything at the back of the closet should be emptied completely). If someone could come an hour earlier before tomorrow vespers to do it it would be great! We are planning to build a bathroom in this closet in August. Please let Alina (alina (at) kirsanov (dot) com) know if you can. Parish Picnic: Our parish picnic to celebrate our patronal feast will be next weekend Sun July 26 at Fr Vladimir’s house chapel in New Germany, near Bridgewater. Liturgy will start at 10:30, followed by a potluck picnic outside. More details including directions to come. We are looking for a carpenter who could build a small washroom inside the unfinished closet in the basement of our church to install a composting toilet there. 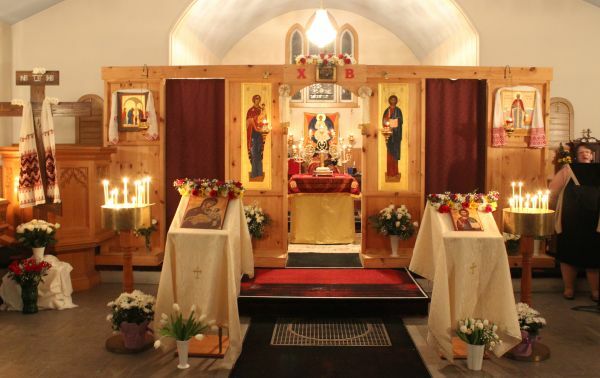 If you have someone in mind (a friend, relative or any contractor you worked with before) who could be interested in such a project for this summer please ask them to contact us at maintenance (at) halifaxorthodox (dot) org. On Saturday, June 20, we are planning a work bee at the Hermitage of the Annunciation. The Liturgy will finish around 9:30, so we are planning to start work around 10 a.m. Please contact Maria at mkoutovenko (at) gmail.com. New purchases: New icons of Christ and the Theotokos have been ordered. These will take about a year to complete. We are seeking contributions towards the cost. There will be a box placed in the entrance specifically for this purchase. We’re also purchasing a shed to be able to safely store fuel and lawn maintenance equipment. If you can contribute to this cost, please put your contribution in the offerings basket in a envelope marked “shed”. Church work bee: We need volunteers Sat June 6 to help to maintenance in and around the church. More details to come. Fundraiser for QEII: David Langstroth, St. Vladimir’s neighbour on Purcells Cove Rd, is hosting (or his quintet is hosting) a fundraiser at Rebecca Cohn on May 13. 2015. His wife, Tasha, has cancer, and the money raised will go to the Sunshine Room at the QEII. The fundraising event promises a lineup of very impressive musicians and fun music. More information about the event is available here: http://www.rhapsodyquintet.com/sgtpepper.htm. Please note that after liturgy there will be a pannykhida for the Ethiopian Christians recently martyred in Libya. Our friend, Orest Ulan, after a long and valiant fight against cancer, fell asleep in the Lord yesterday morning. Please pray for his repose and for the comfort of his family and friends during their time of grief. As we celebrate Pascha, the feast of feasts, we remember that our Lord has conquered death. and no more sighing, but life everlasting. Fundraiser for QEII: David Langstroth, St. Vladimir’s neighbour on Purcells Cove Rd, is hosting (or his quintet is hosting) a fundraiser at Rebecca Cohn on May 13. 2015. His wife, Tasha, has cancer, and the money raised will go to the Sunshine Room at the QEII. The fundraising event promises a lineup of very impressive musicians and fun music. More information about the event is available here: www.rhapsodyquintet.com/sgtpepper.htm. Thank you: Organizing things for Holy Week and Pascha takes a lot of work. Thank you to our clergy, choir, those who helped with clean up and set up, arranged the flowers, organized the potluck and those who contributed food! We appreciate all the work you did. There will be a potluck meal after the Paschal service, please bring a contribution. Sun Mar 29: Many of you are digging out and perhaps choosing to stay home to due road conditions. Reuben is at church now digging out the driveway, however, only a small part of the parking lot will be clear as the plow hasn’t yet come. There will not be liturgy this morning, but Reuben will read typika. If you do venture out, please be careful. Fri Mar 6: Presanctified Gifts 6:00 pm. Please attend if you can. This liturgy is meant to strengthen us as we go through the fast. Don’t forget that clocks go forward an hour Sat night, and Sunday services will begin at 10:30. Fr. Matthew Baker: Giving to others in need should be a part of our fasting discipline. If we look around, we can easily see many in need. On the Orthodox Church of America website, news has been posted that Fr. Matthew Baker, a priest of the Greek Orthodox Archdiocese in the US, was killed in a car accident returning home after celebrating Sunday of Orthodoxy Vespers. He leaves behind Presvytera Katherine and 6 young children. A collection is set up to assist Fr. Matthew’s family. Let us all pray for the repose of Fr. Matthew and pray for his family in their time of need. May Fr. Matthew’s memory be eternal! Confessions: A confession during Lent is required to be able to partake of communion at Pascha. Early confessions are encouraged. Please contact Fr Vladimir to schedule a time. Note that you should contact Fr Vladimir by Friday evening if you wish to schedule a confession before Sat Vespers, as he will be travelling to Halifax during the day on Sat and will not be checking messages. Please come if you can, but check road conditions in your area before travelling Sunday morning to be safe. Nightly Mon-Thurs (Feb 23-26) at 6:00 pm: Small Compline with the Canon of Repentance of St. Andrew of Crete. Please attend these important services if you can. For other services in Lent, please refer to the Great Lent schedule. 7:30-8:30 pm: The Coptic Church of St. Mena (167 Willett Street, Halifax, NS B3M 3L6) is holding a memorial service for the Twenty-One Egyptian Christians killed in Libya last week (see http://www.bbc.com/news/world-31481797). Everyone is invited! A note from Father Vladimir about this tragic event: The Coptic tradition is one of the oldest and most beautiful expressions of Christianity. The tradiiton holds that St. Mark was the evangelist to bring the Gospel to Egypt, and Egypt, at that time oppressed by the Roman yoke, joyfully welcomed the message of freedom and peace promised by the Gospel. The Gospel fell on very fertile soil in Egypt, for the Egyptians had behind them the rich mystical spiritual tradition of three millenia and in that soil Christian spirituality bloomed and blossomed. Some of the greatest Christian saints came out of the Coptic Church — St. Athanasius, St. Mary of Egypt, Thais of Alexandria, St. Anthony the great, and countless others. But no matter how blessed and faithful a Christian community may be, it will not be free from persecution and trials. In II Timothy 3:12, the Apostle warns us that “all who desire to live godly in Christ Jesus will suffer persecution.” Such words could have been spoken directly to our Coptic Christian brothers and sisters, for persecution has been a hallmark of the Coptic Church. Ever since the Muslim conquest of Egypt, Coptic Christians have been the target if torture and persecution. Even in the “civilized” and more enlightened world of the twenty-first century, bitter and savage persecution has not ceased in Egypt. The recent martyrdom of the twenty-one Coptic Christians in Libya is yet another example of the sufferings which have befallen the Coptic Church. To make the martyrdom of these Copts even more bitter, the president of the United States has blatantly denied that these men died because of their faith. Barak Obama has referred to them merely as “citizens”, purposely avoiding any reference to their Christian faith and thereby depriving them of the crown of martyrdom. Despite the anti-Christian attitudes of the world, we recognize these men as Christians who have been tortured and martyred because of their faith in Christ. At the same time, let us give thanks to our Lord Jesus Christ who has given them the strength to bear their martyrdom, to triumph in their faith, and enter into the glory of the eternal Kingdom. With all the saints and martyrs, may these twenty-one martyrs have Eternal Memory. Winter strikes again. As the forecast tomorrow is calling for 20-40 cm of snow over the course of the morning, travel is expected to be difficult. Services are therefore cancelled for Sunday, February 15. Prosphora bakers: please take note. Vespers is still on for Saturday at 6:00 pm We’ll have readers Vespers followed by small Compline with the Canon for the Feast of the Meeting of the Lord. This will be around the same duration as a regular Vespers service. Please come if you can to celebrate this great feast. As many roads outside of Halifax still are ice covered, Fr. Vladimir won’t be coming this weekend. Sun Feb 8: Readers Services — Hours and Typika — at 10:00am. This service lasts approximately an hour. We’re then have coffee hour. Due to road conditions and the ongoing freezing rain warning in Lunenburg County, Fr Vladimir will not be travelling to Halifax this weekend. Sun Feb 1: Readers Services — Hours and Typika — at 10:00. This service lasts approximately an hour. We’re then have coffee hour. Bishop’s visit: A big thank you to all who helped make last weekend run smoothly — those who cleaned and set things up both for services and meals, chauffering our visitors, and other tasks. Thank you!! Reminder — during winter, keep an eye on the weather and your emails in case of last-minute changes due to storms. Bishop Ire’ne’e’s arrival is expected around 7:30pm (subject to flight delays). Upon his arrival, we’ll have a potluck dinner and conversation with the the Bishop. Those intending to come, please bring one dish or a drink. After the service we’ll have a potluck lunch. Eve of Theophany is a strict fast. We ask you to bring one *LENTEN* dish (no meat, fish, eggs, or dairy products) or a drink. The services will be held at the Hermitage of the Annunciation in New Germany (one hour and a half drive from Halifax — see driving directions here). Goose Chase Rd, where the monastery is located, is slippery. The lane to the monastery is sanded, but please use care and drive slowly. At the end of the liturgy: Blessing of Water at the pond of St. Silouan. Then, a potluck meal to celebrate the Feast (please bring a dish — NO MEAT, please — or a drink). The celebration of the feast of Nativity continues! Don’t forget next week His Grace Bishop Ire’ne’e will be visiting us. Further details to come. Reminder: During this lovely time of year known as winter in Canada, bad weather can happen at any time. Please check your email during weekends in case there are last-minute updates to the service schedule due to storms. Parish calendars: The 2015 calendars are for sale now. We have English-only and English+Russian church calendars with service and contact information for our parish. Suggested price is $10. Please put the money in the envelopes marked with “calendar”. Sun Jan 4: CANCELLED due to weather forecast. For those who were scheduled for confession tonight, please come Monday evening, January 5. Father Vladimir will be at church by 6:00 pm. Please come as soon after 6:00 as possible, as Fr. Vladimir would like to end confessions by 7:30-8:00 pm. The Sunday before the Nativity of the Lord is known as the Sunday of the Holy Fathers. On this day the Church commemorates all those who were well-pleasing to God from all ages, from Adam to St Joseph the Betrothed of the Most Holy Theotokos, those who are mentioned in the geneology of Luke 3:23-38. The holy prophets and prophetesses are also remembered today, especially the Prophet Daniel and the three holy youths (December 17). Parish calendars: The 2015 parish calendars will be in church today. We have English-only and English+Russian church calendars with service and contact information for our parish. Suggested price is $10. Please put the money in the envelopes marked “calendar” or place in envelope and write “calendar” on it. Upcoming episcopal visit: His Grace, Bishop Ire’ne’e, will be with us for the feast of Theophany. Further details to come.